The Golden Temple - The Golden Temple of Amritsar,Sri Hari Mandir Sahib,Amritsar Golden Temple Sikh Pilgrimage, Golden Temple in Amritsar,or Gurudwara Golden Temple Amritsar,Golden temple tourism, Golden Temple tour packages,online booking for pilgrimage tours to Golden Temple Amritsar. On your tour to India you will thoroughly like your visit to the Golden Temple in the city of Amritsar as it offers itself as a religious as well as architectural genius. One of the several tourist attractions in Amritsar, the Golden Temple was constructed by Guru Ram Das in the 14th century. It stands as one of the favorite tourist destinations in India. Also known as Sri Harmandir Sahib as well as Darbar Sahib, it is considered to be one of the most sacred sites of Sikh religion. Reflecting both Hindu and Muslim styles of design and architecture, it exhibits a large dome made of gold. Its structural brilliance draws the interest of one and all around the world. Even though, chiefly a sacred pilgrimage for the Sikhs, it is also traveled by travelers from various corners of the world. This temple arranges for Bundara (Lunch/Dinner) all through the year for the tourists. Located in the heart of the city of Amritsar, the 40.5 square feet Golden Temple stands on a 67 square feet platform amid a square tank. There is a bridge leading to the Golden Temple. 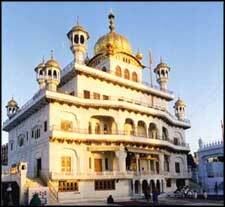 The shrine is representative of the tenets of Sikhism. It also stands for the valor and vigor of the Sikhs. With doorways on all four sides, it symbolizes the tolerance of Sikhism � greeting all four religions with open arms. The bridge that connects to the temple is linked with the 13 feet broad �Pardakshna� (circumambulatory path). It actually runs round the main temple and it reaches the �Har ki Paure� (steps of God). On the first storey of �Har ki Paure�, you can find a continuous reading of Guru Granth Sahib. The main shrine of Sri Harmandir Sahib is a three-storied one. The facade, which faces the bridge, is adorned with continuous cusped arches and the roof of the first floor reaches a height of 26 feet and 9 inches. Atop the first floor a four feet high parapet surrounds on all the borders which has also four �Mamtees� on the four sides and precisely on the pinnacle of the central hall of the main sanctuary mounts the third storey which is a small square room with three gates. On the top of this room is the low fluted �Gumbaz�(dome) with lotus petal pattern at the base of an inverted lotus which actually supports the �Kalash� with a strikingly decorative �Chhatri� (umbrella) at the end. Log on to www.touristplacesinindia.com which gives online information about Golden Temple, the tourist attractions on your tour to Golden Temple, booking for India travel tours, and tour packages on your tour to India.